The same researchers responsible for a study claiming premature birth rates are high near shale gas wells in Pennsylvania — even though they were actually below the national average — and a study claiming fracking is associated with increased asthma flare-ups — even though state data shows heavily-drilled counties had far lower asthma hospitalization rates than counties with no shale gas production at all — have put out a new study today that has just about as much merit. Based off a survey of Geisinger Clinic patients who suffer from at least one of the three conditions, the study claims, “New research suggests that Pennsylvania residents with the highest exposure to active natural gas wells operated by the hydraulic fracturing (“fracking”) industry are nearly twice as likely to suffer from a combination of migraine headaches, chronic nasal and sinus symptoms and severe fatigue.” In other words they’re blaming increased incidences of chronic rhinosinusitis (CRS), migraine headaches and fatigue (the most common symptoms people have across the board!) on fracking. The authors divided the study area into four “quartiles,” noting that a higher percentage of participants in the fourth quartile — shown in the graphic below, taken from the study — showed clear associations with increased instances of CRS, migraine and fatigue symptoms and proximity to natural gas wells. The researchers concluded that this is due to “quartile four” being located in the northeast region of Pennsylvania, where a vast majority of Marcellus Shale natural gas wells (indicated with yellow dots) are located. Tioga County, which has 661 shale gas wells — sixth most in the state — had just four participants, two of which reported symptoms. Bradford County, which has 1,097 shale gas wells — second most in the state — had just 12 participants, 10 of which reported symptoms. Sullivan County, a small county geographically that includes dozens of shale wells, had just 20 participants, 11 of which had symptoms. Susquehana, a major shale county, had 69 participants, 45 which reported symptoms. Lycoming County is the only major shale county with significant representation, as it had 233 participants, 128 which reported symptoms. Bottom line: graphic “A” clearly shows that most of the reported cases of these conditions in “quartile four” were from areas with little to no shale development. All told, a total of just 336 of the study’s 7,785 participants (only 4 percent) live in the five counties that happen to have the most shale development in the study area, as the following map from the study illustrates. “T” represents the total number of participants from each county, and if not for the 233 participants from Lycoming County, major shale counties in the study area would barely be represented. So though the authors say study participants were more likely than non-respondents to live in highest natural gas quartile — which includes the most shale gas production and supports the researchers’ narrative — their own graphic shows most of the participants and cases reported are not near production. Luzerne County, for instance, had more than 1,500 participants, but just two shale gas wells, according to the report. Basically the sample size was far too small in actual shale counties to produce any meaningful results. If anything, their data show greater reported symptoms farther away from shale development, but of course that doesn’t fit in with their predetermined narrative. Note that they report 182 instances of CRS in quartile four, which is supposed to be closest to shale wells, yet quartile one has 181 cases and quartiles two and three have 187 and 188 respectively. So even though the researchers claim air pollution from fracking causes CRS, the quartiles with no development actually reported more cases. The only way the researchers could get higher numbers in quartile four was to add two of the most common symptoms ever – headaches and fatigue – into the mix, as can be seen in the bottom row of data. 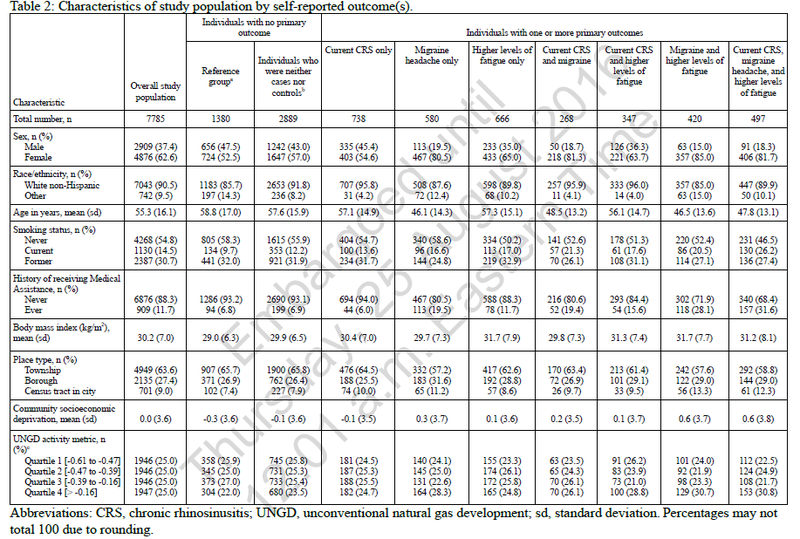 Similar to the CRS data above, EID identified 21 counties in the study area that have no shale production at all. Interestingly, the ratio of total participation to total symptoms reported in these counties (1 : 0.58) is slightly higher than the total participation to total symptoms reported ratio in the top five shale counties discussed earlier (1 : 0.57). You can view the raw data EID compiled to calculate these ratios here. And if you were to add Luzerne County, which has just two shale wells, to the non-shale county data, the ratio would jump to 1 : 0.62. In other words, rates of reported symptoms are actually a bit higher in non-shale counties within the study area — and there is certainly no indication that even remote proximity to shale gas development results in an uptick of symptoms. “We don’t know specifically why people in close proximity to these larger wells are more likely to be sick,” Schwartz said. The study did not determine a causal link, said lead author Aaron Tustin, a resident physician in the Department of Environmental Health Sciences at the Johns Hopkins Bloomberg School of Public Health. “Having said that, we think it’s a possibility,” he said. According to the Mayo Clinic, migraines can be triggered by hormonal changes (in women), foods, food additives, alcohol, changes in weather, medication and several other factors. CRS, which 13 percent (30 million people) of the U.S. population suffers with, is most often triggered by allergies, according to the Mayo Clinic, and fatigue, obviously, has countless causes that have nothing remotely do with fracking. Though EID has pointed it out three times now, it bears repeating: A key member of this research team, as well as the funding of their recent Pennsylvania studies, can be traced to the anti-fracking movement. Of course, it was never a question of funding — but a question of bias — that prompted EID to raise these red flags in the first place! “Maryland’s fracking moratorium is set to expire in October 2017. The moratorium was passed in 2015 out of concern about fracking’s potentially negative environmental effects, before the more recent health studies were completed. Schwartz says Maryland regulators should consider these new scientific findings when they decide whether to allow drilling. While these researchers desperately try to attribute common illnesses to fracking based on “associations,” real evidence of fracking’s contribution to improved public health continues to come to light. Recent studies that actually measure air emissions at well sites – unlike what this study does – have also shown shale development in the Marcellus is protective of public health. The Pa. DEP conducted air monitoring northeast Pennsylvania and concluded that the state “did not identify concentrations of any compound that would likely trigger air-related health issues associated with Marcellus Shale drilling activities.” A similar report for southwestern Pennsylvania came to the same conclusion. It is clear from the researchers’ background and their comments on the coming expiration of Maryland’s fracking moratorium that they are desperately attempting to accumulate severely lacking “evidence” of fracking’s harms to public health. In the meantime, the real data — based on actual emission measurements and official state data — completely contradict the “associations” claimed in this and past papers by these researchers, actually showing fracking has been good for public health and the environment. The researchers have tried to sell the former three times now in the past nine months. But considering their complete lack of evidence and severely flawed modeling, their hopes for a third set of alarmist headlines blaming fracking for the world’s most common ailments may be pushing it.